I would never choose some baroque church or renaissance mansion as my favorite building. They are just too obvious, kitschy and too crowded. On the other hand interwar architecture may not seem beautiful at first sight, you must dig deeper to understand it and through understanding see its beauty and for that reason the crowds will never pay much attention to architecture like this. I appreciate the intimacy I can have with Mali nebotičnik or with other words – This one’s “mine”. Before you start to laugh…I know, it’s not really a skyscraper (nebotičnik), but it has a specific shape, so from a certain angle there’s maybe an optical illusion that it’s (a little bit) higher. And you’re not supposed to appreciate it because its height, but because of its charisma. 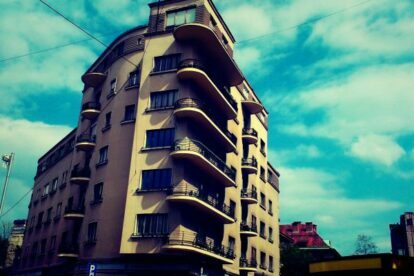 Even younger architect Edo Ravnikar respected this building so much, that he designed his residential complex in a way that preserves its dominant role. There are some fun facts about this building (e.g. a part of it was 80 years ago the first vegetarian restaurant in Ljubljana), but I’m not going to bother you with that. I’ll finish with an add: if anyone knows someone who’s got an apartment for rent over here…give me a call :).